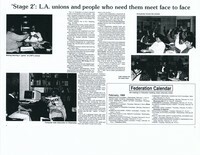 Stage 2: L.A. unions and people who need them meet face to face, The Federation News, January/February 1989, pp. 4-5. An article in the L.A. County Federation of Labor Newsletter profiles the Labor Immigrant Assistance Project (LIAP) and the California Immigrant Workers Association (CIWA), both efforts by the labor movement to reach out to new immigrants. As the AFL-CIO Executive Council convenes in Los Angeles, the author surveys recent successes in unionizing immigrant workers and asks if Los Angeles represents the future of work and the labor movement. 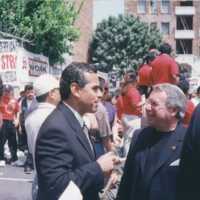 The Justice for Janitors History Project website is a project of the UCLA History Department and the UCLA Center for Labor Research and Education. Funding for the porject was provided by the UCLA Institute for Research on Labor & Employment. Copyright 2011, Center for Labor Research and Education.